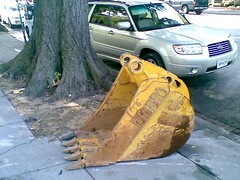 I’m not sure what the story is behind this backhoe bucket and hydraulic demolition pick sitting forlorn in Foggy Bottom this morning, just feet apart on a Penn Ave sidewalk, but the mother to these poor orphan tractor parts was nowhere in sight. I weep for them. 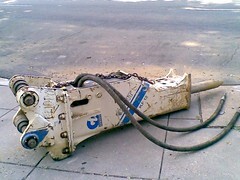 You should put an ad on Craigslist and freecycle for them.